Chainsaws, Slackers, and Spy Kids chronicles the evolution of this struggle by re-creating Austin's colorful movie history. 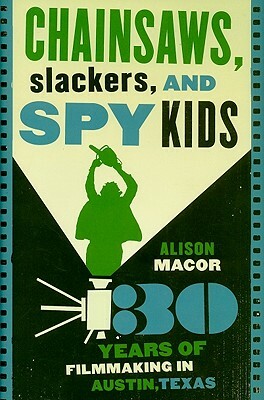 Based on revealing interviews with Richard Linklater, Robert Rodriguez, Mike Judge, Quentin Tarantino, Matthew McConaughey, George Lucas, and more than one hundred other players in the local and national film industries, Alison Macor explores how Austin has become a proving ground for contemporary independent cinema. She begins in the early 1970s with Tobe Hooper's horror classic, The Texas Chainsaw Massacre, and follows the development of the Austin film scene through 2001 with the production and release of Rodriguez's $100-million blockbuster, Spy Kids. Each chapter explores the behind-the-scenes story of a specific movie, such as Linklater's Dazed and Confused and Judge's Office Space, against the backdrop of Austin's ever-expanding film community.